The Kerala legislators first stopped by at the assembly canteen before heading for the debate on the new central government rule that they say infringes upon the states' rights. The assembly canteen staff had arranged 10 kg beef for the breakfast. The lawmakers of Kerala today held a special assembly session to discuss Centre's cattle trade rules, against which most parties are up in arms. Beef is a staple in Kerala, and the discussion started with - what else -- plates of hot beef fry. Kerala, along with Tamil Nadu, Karnataka and a few north-eastern states, has witnessed hundreds of protests since the rule -- banning sale and purchase of cattle for slaughter in animals markets -- was introduced. A huge section of Keralites have already enthusiastically participated in the hundreds of beef fests held across the state by the workers of the CPM, which leads the state's ruling LDF. Most of the legislators stopped by at the assembly canteen before heading for the debate on the new Central government rule, which, they say, infringes upon states' rights. An employee of the canteen told news agency IANS that on normal working days, when the assembly is in session, beef is usually served only after 11 am. "But today, with the session devoted to discussing the beef issue, we brought 10 kg beef early in the morning. A good number of MLAs had beef fry before heading for the assembly floor," the staff member was quoted as saying by IANS. 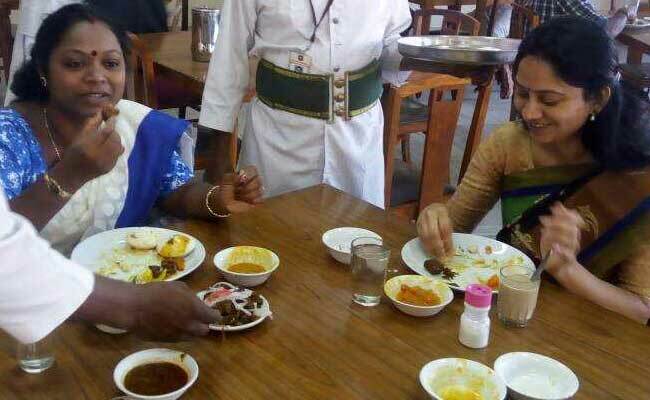 The CPM legislator from Devikulam, 285 km from Thiruvananthapuram, S Rajendran, was the first to be served steaming hot beef dish, the canteen attendant had added. CPM legislator Pratibha Nairlater explained, "I don't usually eat beef for breakfast, in fact I eat it very rarely. But as a protest against the Central government, I ate it today morning". The CPM, which leads the ruling LDF, has held beef fests across the state. The Congress courted controversy after a cellphone video of a few of its youth wing members slaughtering a calf was widely circulated about two weeks ago. During the discussion in the Assembly, Chief Minister Pinarayi Vijayan moved a resolution against the manner in which the Centre had floated the new rule in May. "This new rule is a blatant violation of the rights of individuals to eat what they wish. It will hugely affect the agrarian society both Kerala and the country," Mr Vijayan said. Mr Vijayan had earlier written to Prime Minister Narendra Modi and all chief ministers of the country to protest against the rule. The Central government has said the intention of the rule was not to control people's food habits, but preventing cruelty to animals. In the backdrop of the debate, Union minister Venkaiah Naidu had pointed out "food is a matter of choice" that he himself is a non-vegetarian. The session passed a resolution demanding the rollback of the Centre's cattle trade regulation with support of all Left Democratic Front legislators and United Democratic Front legislators. The only opposition came from BJP's sole legislator in the state, O Rajagopal.